In the nature, flowers and leaves from Cherry tree fall off on the ground and become nutrients to the soil which are in turn absorbed back to plants. Ants get food from plants and also leave nutrients back to the plants. Therefore, human also can be a partner with the nature. 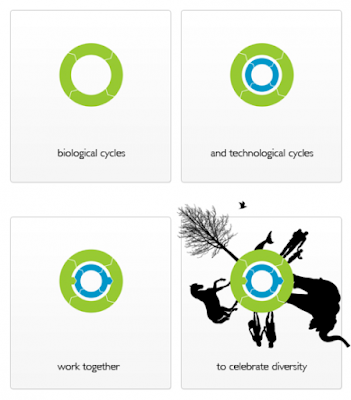 Learn the biological cycle of the nature and make it the technical cycle. We can design new products that can be decomposed after use and become nutrients to the Earth, or that can be reused to become a new material for a new product. No need to dispose, burn or bury under the ground; no more burden to the earth. We can color our world, not to destroy it. After a long term of efforts, environmentalists suggested many methods that can decrease the damage to the environment from the industry. Reduce, Reuse, Recycle and Restrictions, these are the “less bad” policy. Most people think “Reduce” is the best method that can satisfy the ecology, but no matter how much toxic waste is reduced from the process, emission is limited or raw materials are cut down, none of them can prevent the earth from being destroyed by the waste, it just postpones the time of destruction. Even there is just a little amount of dangerous emission, it will affect the biological system and harm the world. For example, there are 100,000 people die annually in the US since 1995 because of tiny particles. No kidding. Reuse seems to provide a means for the waste to go “away”, but if the waste contains toxic contaminants, it will come back in another form. In developing countries, people will recycle sewage sludge into animal food. Normally, the sewage sludge contains heavy metals, dioxins and endocrine disrupters. When sewage sludge is used to farm or fertilize plants, flowers or vegetables, the harmful substances would go into the animals and our body. 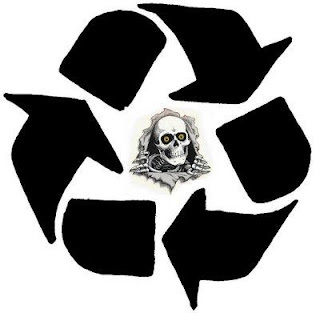 For recycling, is it good for the environment? It depends on what kind of items is being recycled. Most book or magazine publishers, they usually use fancy and colorful papers to attract consumers to buy their products, and they never think about environmentalism. After the fancy and colorful papers are recycled, factories need to put a large amount of bleach and other chemical processes to make them blank so that they can be reused. Also, the fibers of the recycled papers are short and less smooth than virgin paper, so small particles will be easily released into the air and inhaled into human body. Some people get allergies from newspapers because most newspapers are made from recycled paper. Governments play as a guardian and regulator; they force companies to regulate their products to conform to their rules under punishment, but less rewards are granted to the companies who take initiatives. The point is, if they follow the rule, they need to pay more and more money to regulate their products. Therefore, companies will never be ardent to solve the problem and will not make any effort or spend more time to work for a new design. It in turn makes companies legally pollute the area by their thoughtless designs. The concept of eco-efficiency in the public is creating more goods and services, while using fewer resources and creating less waste and pollution. Unfortunately, Eco-efficiency is not a perfect concept because it doesn’t reach deep enough. We can not rely on eco-efficiency to save the environment. In the long term, it will let the industry finish off all the resources. For instance, one of the energy-efficient building in Germany, it successfully decreases the number of the standard rate of oil used. It achieves a better insulation – less air comes into the building. On the other hand, due to smaller and lack-proof windows, it reduces air-exchange rate, and increases the poor indoor air pollution. In turn, more air-freshener machines are needed in the room and more money has to be spent on electricity. At the same time, more fossil fuel is used to transform into electrical power. Our goal is zero waste and zero emission. 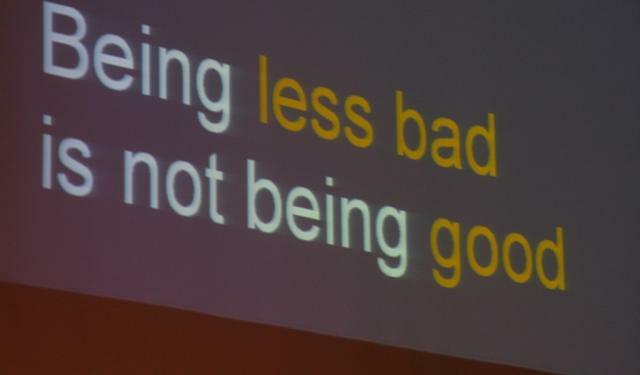 “Be less bad” is a failure, because it will keep producing a bad design and destruct the environmental system. 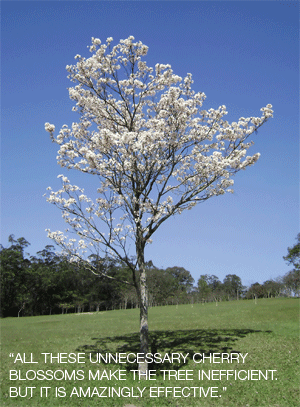 For generation after generation, a Cherry Tree will grow flowers, fruits and await an animal to eat its fruit and drop down the seed somewhere else so as to grow another Cherry Tree. No one will complain the flowers falling all over the ground, and think the flowers are wasted. In fact, the flowers, fruits and leaves of a tree will decompose and break down into nutrients for soil, plants, insect and animals. This process is a zero burden to the nature. 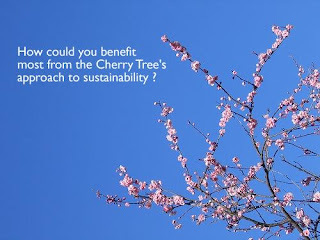 Can the house human build become a zero burden to the nature like the Cherry Tree? Let’s compare the big energy saving eco-efficient house that human build and the house by Cherry Tree, and see if Cherry Tree can build a house like human. The human-built house will have a closed window to minimize air infiltration. A better thermal insulation system can prevent cold or warm air loss, so human will use dark-tinted glass for windows to prevent excessive use of air-conditioning as sun light directly enters the room heating up the temperature. Hence, the electricity cost is reduced, less fossil fuel energy is used by the power plant, and less emission is released and causes air pollution. As a result, the house will be energy saving and environmental friendly. For the house built by Cherry Tree, Sun-light enters the house during the day-time. With an open and un-tinted window, fresh air will cool down and flow around the house. At night, the cool evening air will decrease the room temperature and re-fresh around house. There are layers of soil with grass covering the building roof. It can be a new home for animals and birds. Also, it can absorb rain to cool down the house temperature and prevent ultraviolet. Both houses function as energy-efficient, but the Cherry Tree one design is more complicated for people working there. It might sound strange to build a house by using nature system, but back in the time in Europe, there were a lot of old farms that was built with stones, wood and sod. Grass was placed on top of the roof as well. One of the projects the author did was building a garden on the roof of Chicago’s City Hall. After the project was done, Mayor Richard Daley predicted all house roofs in the whole city would become all green similar to the one of Chicago’s City Hall. The functions of the green roof are to provide a new home for many birds and other animals, cool down the temperature of the building, and flower, and to grow plant and food by natural sun light. 1. Building that, like trees, produce more energy than they consume and purify their own waste water. 2. Factories that produce effluents that are drinking water. 3. 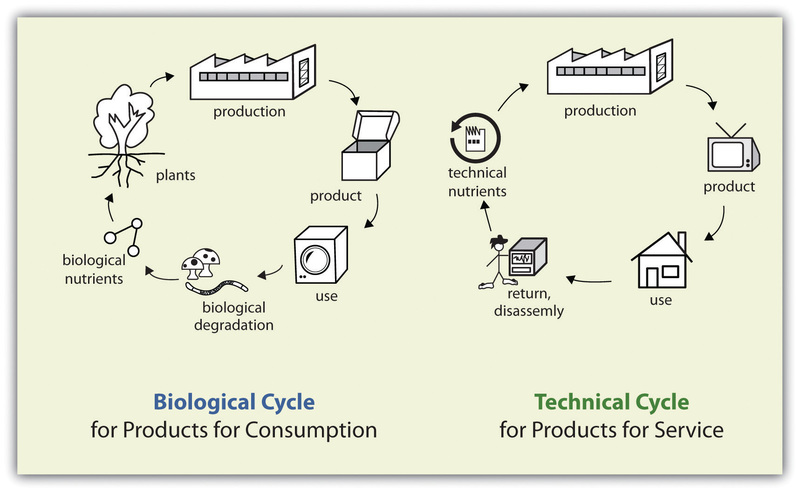 Products that, when their useful life is over, do not become useless waste but can be tossed onto the ground to decompose and become food for plants and animals and nutrients for soil; or, alternately, that can return to industrial cycles to supply high-quality raw materials for new products. 5. Transportation that improves the quality of life while delivering goods and services. 6. A world of abundance, not one of limits, pollutions, and waste. A good design should consider different factors, it can not just concentrate on its own profitability. We can conceptualize and creatively examine a proposed design based on a visualization tool. The tool is a graph of triangle. 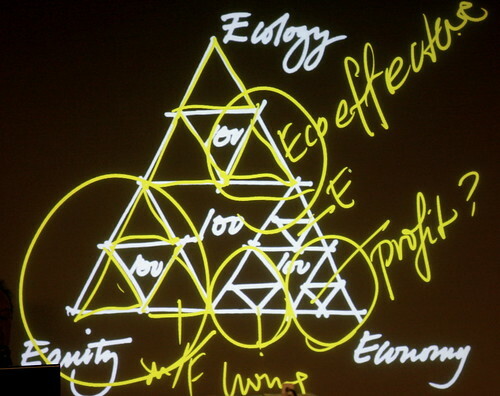 First, the bottom right is the area of Economy. In this area, we can think about whether a manufacturing design is based on its own profitability. If the answer is yes, then it is not a good design. Second, the area between Economy and Equity is the question about whether a manufactory pays a reasonable amount of salary to its workers? Is it good enough to maintain workers’ living standard? Third, the area of Equity, does the manufactory pay an equal salary between male and female? Fourth, the area between Equity and Ecology, will the workers absorb toxic chemicals during the production in the factory? Fifth, the top area of Ecology, does it apply the rule of nature during the process of production? Waste equals food?Finally, the area between Ecology and Economy, does the factory wants to cut down the cost of design to produce a product that will damage the environment? This is a valuable tool to help manufactories reconsider their design of products. Publicado por ekuazion en 6:27:00 p. m.